The Tale of Mally Biddle reminded me a lot of a Disney movie. It was very innocent – it was never too “scary,” the romance was barely present, and familial relationships were strongly focused on – and would appeal more to a middle grade audience. Mally was an admirable character: spunky, kind-hearted, and fiercely loyal to both her friends and her kingdom. Her loyalty caused her to make some rather impulsive decisions at times, but that just made the adventures that much more fun to read about. And she has such a fun name! Aside from one major mystery, there isn’t too much suspense or action. I had correctly guessed the plot twist as soon when I read the synopsis, but it was still nice to see how it came about. 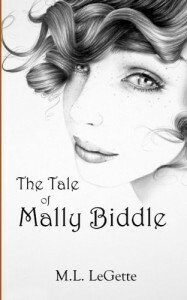 Overall, The Tale of Mally Biddle is a cute, light read for younger teens. This review can also be found at The In-Between Place. Thanks to Netgalley for providing me with a copy of this book in exchange for an honest review.